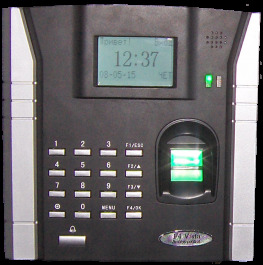 F4 Vista is a standalone biometric terminal for access control and time attendance management with fingerprint PIN identification. F4 Vista use the professional static electricity prevention and anti jamming design, all of the input or output interface are protected from over-voltage and frequency, it has the function of anti-dismantlement alarm and professional alarm, as well as the voltage and PFK watchdog inspection, outstanding quality. Alarm function : Can give alarm when destroying it, illegally open door, threatened by hijackers, and output touch off alarm signals, circumscribed alarm, alarm lamp, alarm lamp or alarm host computer, Wiegand In and Wiegand Out. Function keys: 4 function keys.